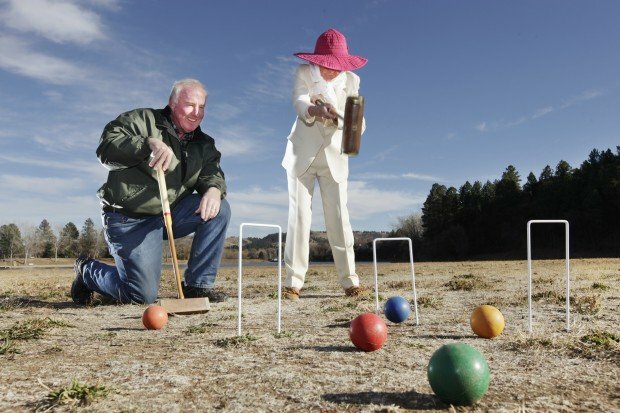 The Canyon Lake Chophouse wants to build Rapid City's first croquet court. Chophouse owner Mike Derby, left, and Gaye Turtur demonstrate the game on the grounds of the proposed croquet site on Canyon Lake. 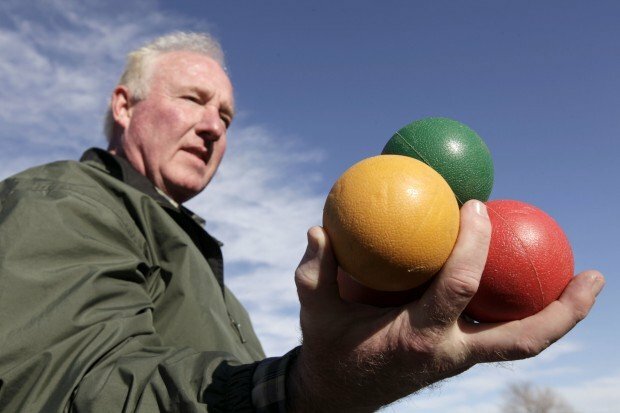 Mike Derby holds three croquet balls used to play the game. Croquet is played with mallets that can be either round of square, Gaye Turtur said. Canyon Lake Resort owner Mike Derby's plans extend beyond just croquet courts and include volleyball and horseshoe courts, all on city park land. Derby is working on an agreement with the city to build the courts. When Gaye Turtur moved from Florida to be closer to her daughter in Rapid City a couple years back, she not only left behind the abundant sunshine and sandy beaches, she also said goodbye to her favorite pastime — the backyard game of croquet. With no permanent local croquet field, Turtur tried playing the game on patchy, weedy grass near Canyon Lake on the city's west side. But those bumpy conditions are crummy for croquet, a skill game that has characteristics similar to golf except that wooden mallets are used to hit far larger balls along close-cropped grass through tiny metal gates called wickets. "The ball would hit the weeds and it would fall back," essentially removing any skill and fun from the game, Turtur explained. "I miss it terribly," she said of the game. So now, Turtur has launched a plan to build a proper croquet field on city land at Canyon Lake Park which she said would not only allow for casual play by locals, but could also capitalize on an apparent rebirth in interest in croquet across the country. She hopes a new, well-maintained playing field could attract professional tournaments and all the spin-off economic benefits that would follow. Turtur has found a local businessman to back her efforts in Mike Derby, owner of the private Canyon Lake Resort that is just west of the lake and city park. Derby is working on a memorandum of understanding with the city to build and operate the courts on city parkland. Derby said his resort will pay for both construction and maintenance, though he doesn't know how much that will cost yet. "It's a win-win for both the city and us. It's a totally underutilized use of park land property over here," Derby said. Derby hopes to begin construction in the spring and aims to open the courts by summer of 2014. He has been working on the project since December of 2011. Derby intends to have a croquet set available for loan or rent so casual players can come to the court for a date or outing with friends. "They'd be open to the public, for the public's use and it would just be an enhancement of this part of Canyon Lake that's not being used right now," he said. Turtur, who has played croquet in Florida, Connecticut, New Jersey and New York, is distributing a petition to push for a croquet club in Rapid City. So far, she said, she has collected more than 27 signatures, enough for at least one croquet club. If she manages to start a club recognized by the United States Croquet Association, it would be the only one in South Dakota. The nearest clubs are in Denver and Fargo. With club status and two croquet courts, Rapid City could potentially host regional tournaments, she said. Originally, Turtur aimed to get the courts built at Memorial Park, partly to draw more people downtown, but that idea stalled. When Derby heard Turtur was trying to get a croquet court, the two teamed up on a plan to build courts at Canyon Lake Park. Professional croquet is different the backyard variety, with very precise rules. In the professional game, the cast-iron wickets are only one-sixteenth of an inch wider than the balls, which weigh one pound and are only blue, red, black and yellow. Players hit the balls through a series of wickets, thus accumulating points. One big change from the backyard: gone is the rule allowing a player to step on their own ball while in contact with an opponent's ball, and then smack the other player's ball as far from the next wicket as possible. Professional croquet is a little more dignified, Turtur said. But she noted that croquet players like to have a good time, and often do some wining-and-dining after a match. "Croqueters are people that like to party," Turtur said of the game that originated in London in the 1850s. "I enjoy the camaraderie of croquet. They were always known to have champagne and wine after the games." Croquet is easy to learn quickly, so it's a great family game that encourages people to get outside and move about, Turtur said. But it also requires strategy when played at a high level, she said. "It's like playing chess on grass, so you have to think about it, too," Turtur said. "It's yet another sport that is not as demanding as tennis or golf." Turtur and Derby have no specific timeline of when they may bring their proposal to the city council for consideration.